Vauxhall Insignia 1.4T review | What Car? What is it? 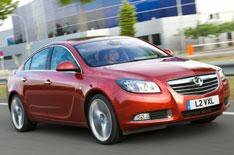 Vauxhall has added a turbocharged 1.4-litre petrol to the Insignia's extensive range of engines. The 138bhp 1.4 is equally as powerful as the 1.8-litre petrol that's also available, but it offers better fuel economy at 47.9mpg, and lower CO2 emissions of 134g/km (compared with the 1.8's 37.2mpg and 179g/km). The 1.4 costs 710 more than the 1.8, but it does get an engine stop-start system. The VX-Line trim of our test doesn't hurt the economy, either, despite its 19-inch alloys and a styling pack that includes front and rear spoilers, and sideskirts. What's it like to drive? The Insignia is reasonably responsive at lower speeds, but get caught in a gear that's too high and it struggles to pull the car's sizeable bulk. Drive in a more enthusiastic manner, and the 1.4-litre emits a sporty engine note, although it remains refined and quiet at lower speeds. The VX-Line pack adds a stiffer and lower suspension set-up. The Insignia feels stable and secure on the motorway, but the steering is vague, while its ride and handling fall short of the class-leading Ford Mondeo's. What's it like inside? The big Vauxhall comes with an attractive cabin that is easy to get comfortable in. Rear visibility is limited, so parking sensors make a crucial addition. Boot space is a generous 520 litres, and the back seats are easily folded to create a 1470-litre loadbay. However, while the space is good, it is not quite as large as that offered by the Ford Mondeo. Should I buy one? The 2.0-litre diesel's superior economy will appeal to Insignia owners who do the majority of their mileage on motorways, but this 1.4-litre unit still makes a compelling case. The engine sounds good, and the turbocharger means it's capable of reasonably lively performance, although the shortage of low-down pull is woeful in a car of this size and will be missed by those used to diesel power. However, the 1.4 is cheaper to buy and it's in a lower company car tax bracket than most versions of the diesel, so it still makes sense for people who cover fewer miles.